Arrive Athens airport and transfer to your hotel. Day at leisure. In the evening, enjoy an optional Athens by night tour and try your hand at a dinner at a typical Greek tavern in the Plaka (optional), the city's buzzing night spot. Overnight. Breakfast. 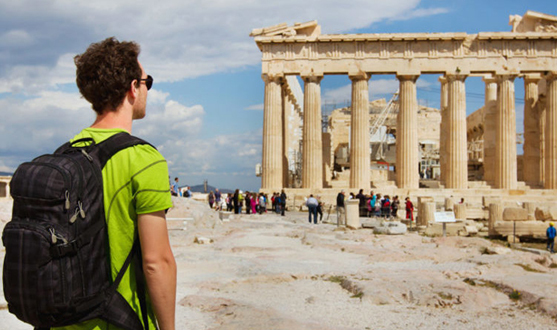 This morning, enjoy the city tour with a visit to the famous Acropolis. Expert guides take you to see the center of the city including Constitution Square (Syntagma), the Parliament, the Memorial to the Unknown Soldier and the National Library. See the Panathenaic Stadium (where the first Olympic Games of the modern era were held in 1896), the Temple of Olympian Zeus and Hadrian's Arch and very many sites. And finally the Acropolis, visit the architectural masterpieces of the Golden Age of Athens: the Propylaea, the Temple of Athena Nike, the Erechtheion and finally, the Parthenon. After a morning tour full of images continue in a local restaurant under the slopes of Acropolis for lunch. After lunch depart for a wonderful drive along the scenic coastal road which affords a splendid view of the Saronic Gulf, passing through some of Athens most beautiful suburbs (Glyfada, Vouliagmeni, Varkiza) to CAPE SOUNION. Cape Sounion is only 45 miles (70 kilometers) from Athens, making it the perfect lazy afternoon tour destination. The Cape's Temple of Poseidon is perched on a rocky hilltop overlooking the sea. The view across the Aegean is magnificent with one of the most breathtaking panoramic views in the world, extending all the way to Kea and the Peloponnese on a clear day. The Temple of Poseidon was built in 44 B.C., and many of its original Doric columns are still standing. One of the columns has a graffiti left by none other than Lord Byron in the early 1800s. The precipice is a sheer 197 foot drop to the sea. Overnight. Breakfast. Our friendly staff will transfer you to the port for your ferry to Myconos. Upon arrival at the port of the island of Myconos you will be met, assisted and transferred to your hotel by our friendly staff. Rest of the day at leisure. Breakfast. Explore on your own. Very popular island, with splendid beach coves, quaint narrow streets laced with whitewashed houses with balconies where you can meet artists and jetsetters alike. Windmills give an extra romantic touch to his lovely island. Lots of air tavernas, offering an array of Greek delicacies. Nothing can detract from the beauty of its landscape, its photogenic churches and its sandy beaches. It is truly an island of Paradise. Overnight. Breakfast. Board a high-speed ferry for the stunning volcanic island of Santorini. 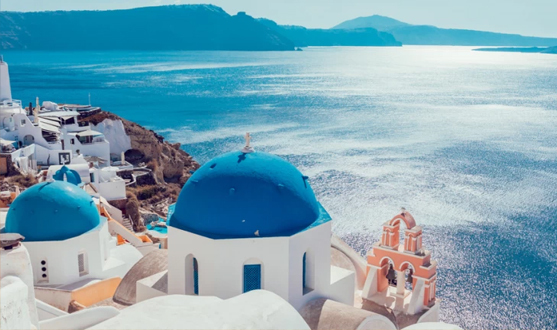 Regarded by many as the most spectacular Greek island, Santorini boasts ancient rock formations, raw lava- layered cliffs, and beautiful black sand beaches. Overnight. Breakfasy. In the morning, you will be picked up from a designated pick up point and taken to Athinios port in order to take the traditional boat. The first stop is to the islet of Nea Kameni where you'll have the opportunity to climb to the crater (1 ½ hour). Next the boat stops to Palaia Kameni for a short swim to the Hot Springs, which are considered to have healing powers (30 minutes). Afterwards head to Thirassia island, where you have 2 hours free to explore the island, swim or have lunch. Finally, the boat sails along the coast and ends up to the port of Athinios. Overnight. 7 nights' accommodation including breakfast and taxes. 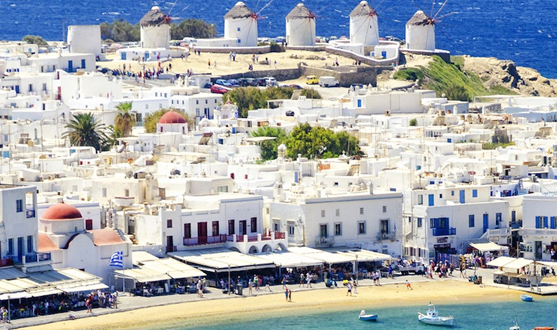 Return port transfers at Mykonos & Santorini on private basis. Economy Class Ferry Tickets for Athens – Mykonos - and Santorini to Athens. Economy class speed boat tickets from Mykonos – Santorini. Half day Athens city tour & afternoon Cape Sounio on SIC basis. Half day Caldera/Volcano tour in Santorini on SIC basis with transfers. All tours can be added to on optional basis.